Baahubali first day earning crosses 60 cr inr : Box Office collection Report : Baahubali : The Beginning smashes the box office on friday and created many records with it’s huge huge earning. The first record of Baahubali is, it is the highest budget movie of Bollywood with approximately 200 cr. 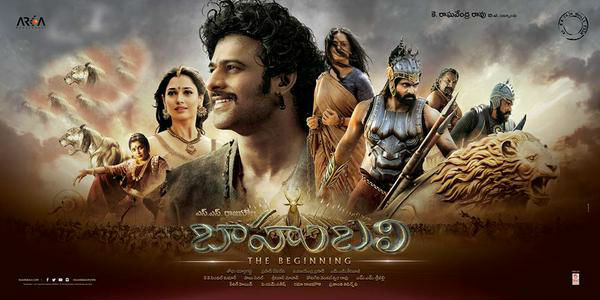 All predictionsof first day collection of Baahubali movie are going wrong as it crosses rs 60 Cr. The Fan of Baahubali movie became crazy to watch it on first day and as per the news, in many theaters the tickets were sold on rs 4000+ in Black. But Fan bought tickets on this price to watch Baahubali : The beginning. SS Rajamouli’s Baahubali : The Beginning released in around 4,200 cinema halls across the globe on 10 July. This was in the list of Most awaited movies of 2015. As this movie is originally in Tamil language, But it is rocking in all it’s dubbed version. on first day it crosses 5.15 cr in hindi dubbing that is also a record of Baahubali. Baahubali : The Beginning Global collection crossed the rs 60 cr on its opening day and this is the highest collection by any Indian movie. Now fans are still in line and the number of movie liker is increasing on the second day of Baahubali release. Baahubali movie second day box office collection may cross rs 50 cr inr and will set another record. As per the experts and critics, “Baahubali : The Beginning” will cross 500 Cr withing a week and it will be the highest income movie of 2015. Let’s wait and watch what will be next with this smashing hit.